As the NYPD and the Port Authority of New York and New Jersey iron out the final plans for the World Trade Center site, new details are emerging—including this week's news that the roof of the site's vehicle security checkpoint at the WTC will be occupied by a lovely elevated park. 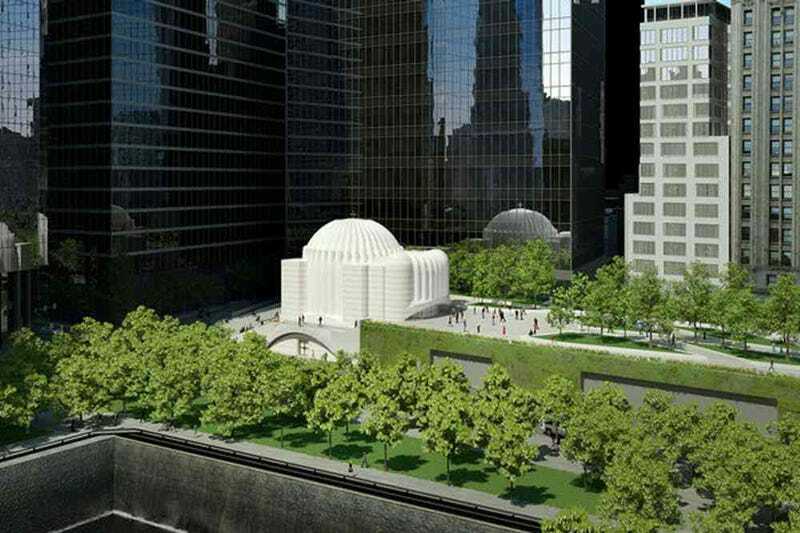 The big reveal wasn't planned: In fact, the Port Authority was forced to release the scheme after the architect of the nearby St. Nicholas Church, Santiago Calatrava, posted renderings of the site to his website. A few weeks later, the Port Authority unveiled a very early schematic rendering of Liberty Park (along Liberty Street), designed by the landscape architect Joseph E. Brown and AECOM. It shows a wide swath of greenery interlaced with concrete sidewalks—not unlike West 8's design for the High Line—that culminate in the glowing, accordion façade of the Greek Orthodox church. It's still early days as far as the park itself goes, but The New York Times reports on a massive green wall that will span the 30 foot wall below the park's edge (as well as a host of trees with notably interesting names: honey locust, stellar pink dogwood, apple serviceberry). But what's also very notable, of course, is what's under this little piece of greenery: The WTC's Vehicular Security Center, where workers will screen every car, truck, bus, and package that comes into the carefully guarded site, checking for radioactive material as well as traditional explosive residue. As you might imagine, this building is nothing short of a bunker, designed to withstand blasts without letting the other, more sensitive buildings come to harm. Embedded below grade in a box of solid concrete, the building's walls are reinforced with enough steel to equal one tenth of the weight of the Eiffel Tower. It's far from the only intensive security measure being put into place as workers prepare to put the final touches on the WTC site, which will be hemmed in by dozens of security checkpoints, hundreds of three-foot-tall barriers, and sally ports. In fact, a group of neighborhood residents and advocates are now suing the NYPD because of the site's "fortresslike isolation." But there's no clear alternative to the plan, either—at least as far as the NYPD is concerned.